I’ve had my iPhone 4S for just over a year. It was my first smartphone and there was a bit of a learning curve to try and figure out all the ins and outs. I look back now and wondered how I managed without my smartphone. I never leave home without it! I’m still learning about apps, SIM cards, and I recently discovered portable batteries! 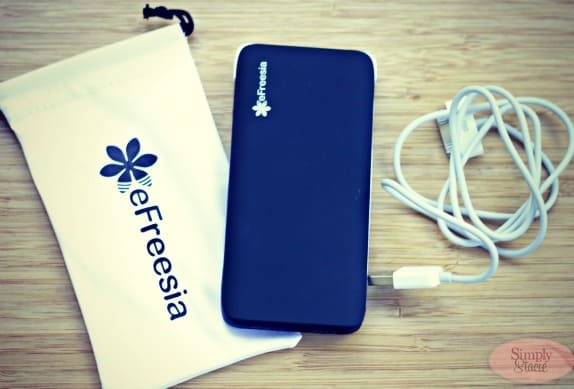 I was clueless to portable power until I was introduced to eFreesia through a review that Gina did on the eFreesia Bar. I’d only been charging my iPhone with the cord that came with it. Normally, I’d charge my iPhone with the outlet on my stove since our kitchen doesn’t have that many outlets to pick and choose from. Needless to say, I love having the eFreesia Duo Portable Smartphone Battery Charger because I can cook while my phone is charging! Silly benefit I know, but it’s a reality for me. 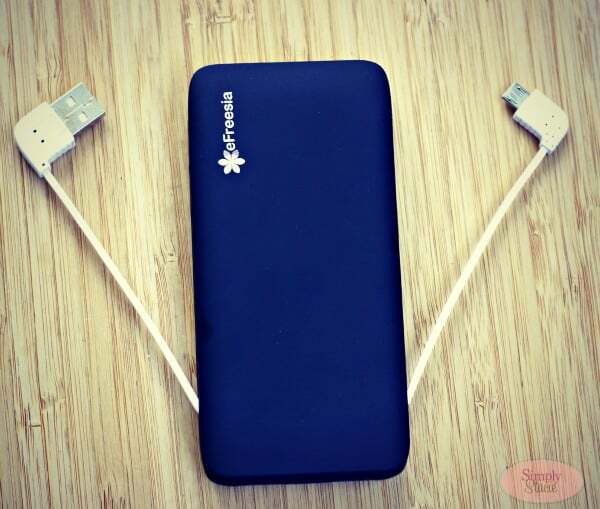 The eFreesia Duo is powerful and lightweight and is about the same size as my phone. It comes with a cord similar to the one I use on my iPhone that I use to charge my phone. Turn it on, plug it in and charge away. It also comes with a built-in cables with micro-USB. The built-in cables are found on both sides of the device. You simply slide the tabs open and out pops the cables. One of them you use to plug into the USB on your computer to recharge the battery. The blue indicator lights will tell you how much power is left and you can judge when you need to recharge it. It also lets you charge two devices at once. I can use it to charge my iPhone and Google Nexus 7 tablet at the same time. Saves me an outlet! 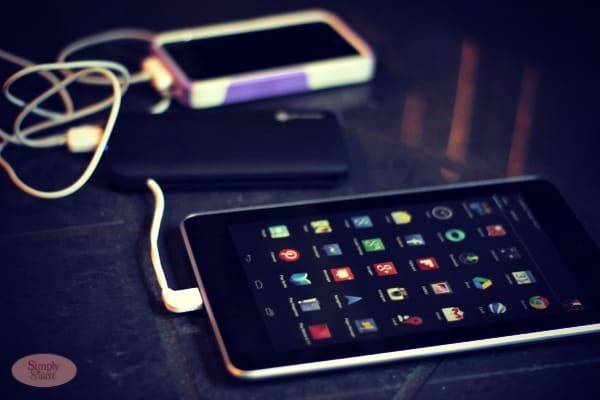 It works with smartphones, tablets, MP3/MP4 players, Bluetooth headsets, handheld gaming devices, mobile WiFi hotspots, and USB chargeable devices. One major benefit the eFreesia Duo offers me is freedom. 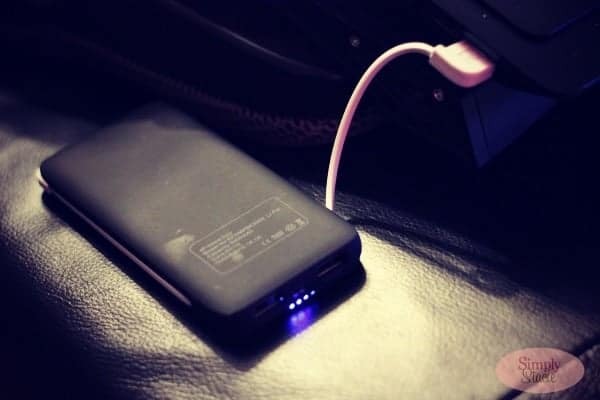 I love not having to worry about my phone dying when I’m out for the day either shopping or on a road trip to the city. It’s small, compact and comes with its own carry pouch. It fits easily into my purse and is there if I need it. When John and I travel anywhere, we can never get direct flights and usually have to do the “milk run”. I’m usually stuck looking for outlets in the airport which is an adventure depending where you are! I’m looking forward to bringing it with me on our next vacation wherever that may be! Another worry that often crosses my mind is how will I charge my phone if the power goes out in the house. That’s happened a few times in the last year and thankfully my phone was charged. I get a little more peace of mind knowing that I have the eFreesia Duo here now in case it happens again. It comes in two colours: black and white. I went with black for mine. I have to also say that the service I received from eFreesia has been top notch. Since it was my first portable battery, I had some questions. They answered all my questions promptly and were very patient. I could tell that they are a company that values customers. eFreesia offers a 1 year plus 1 extra month warranty on all their products. 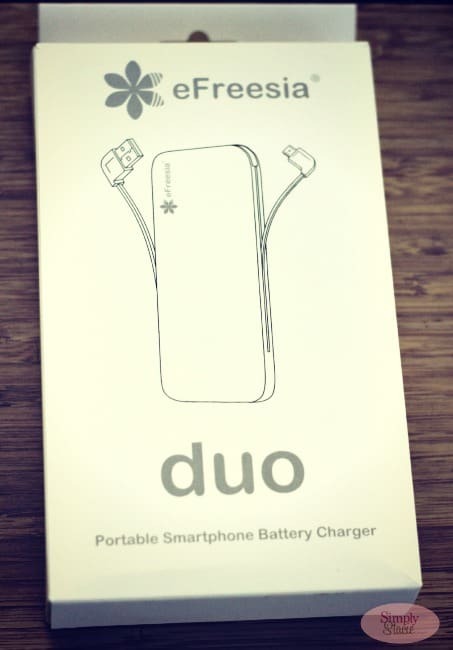 The eFreesia Duo I received is $39.99, but they also have other portable power products you can check out to see which one is the best fit for you. They offer screen protectors! I need one of those. I like that you would be able to charge any device with a USB connector. Very versatile! I like that you can charge 2 things up at once. I liked the screen protectors! I like all three of their chargers. I love that you don’t have to depend on an outlet! eFreesia offers a one year plus one extra month warranty on all eFreesia products. We are so confident and certain that our products life is much longer than promised. i like the efreesia mini and the duo is pretty cool too! I like that you can charge to things at once. My fiance flies a lot and could really use this at the airport. Great for Father’s Day!! I like that it can charge two things at the same time! I learned that the company is located in Irwindale, California.